TEXAS POLICY BURGER: A third pound homemade patty topped with Monterey Jack and cheddar cheese topped with sautéed jalapeños, onions and jalapeño ranch. ALL AMERICAN: One third pound homemade patties, crispy bacon, cheddar and monterey cheese, lettuce, tomatoes, onions and pickles. CHICKEN TENDER BASKET: Four crispy chicken tenders fried to perfection with a side of seasoned battered fries, and your choice of homemade melted queso and jalapeño ranch. 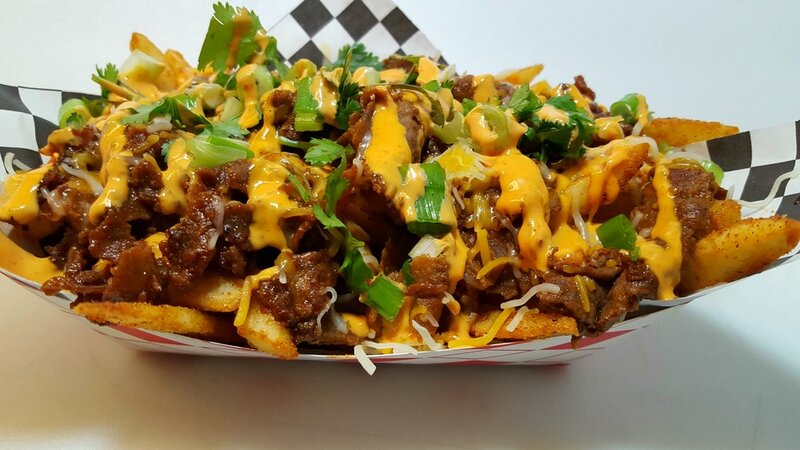 KOREAN FRIES: A bead of seasoned battered fries with melted homemade queso topped with Our Famous Korean BBQ Beef, cheddar and monterey cheese, green onions, cilantro, Korean spicy sauce and kimchi. 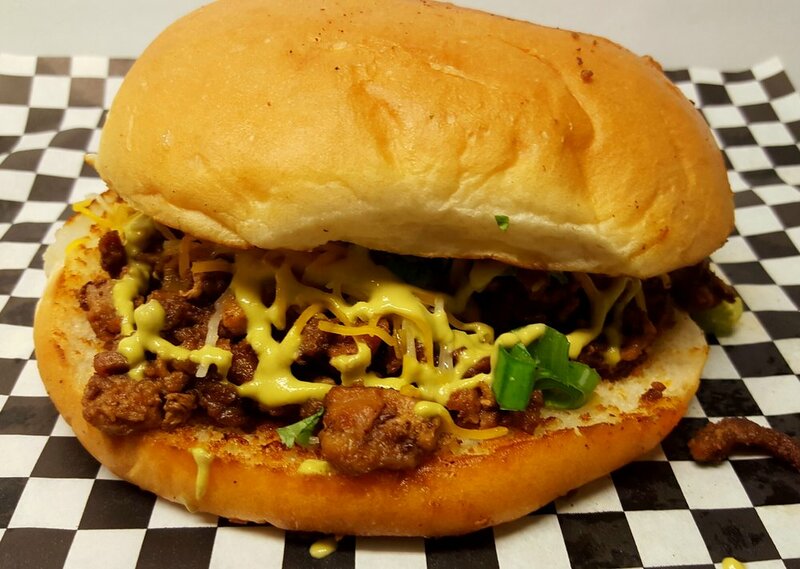 KOREAN BURGER: A 1/3 lbs homemade beef patty topped with Our Famous Korean BBQ Beef, cheddar and monterey cheese, green onions, cilantro, Korean spicy sauce and kimchi. 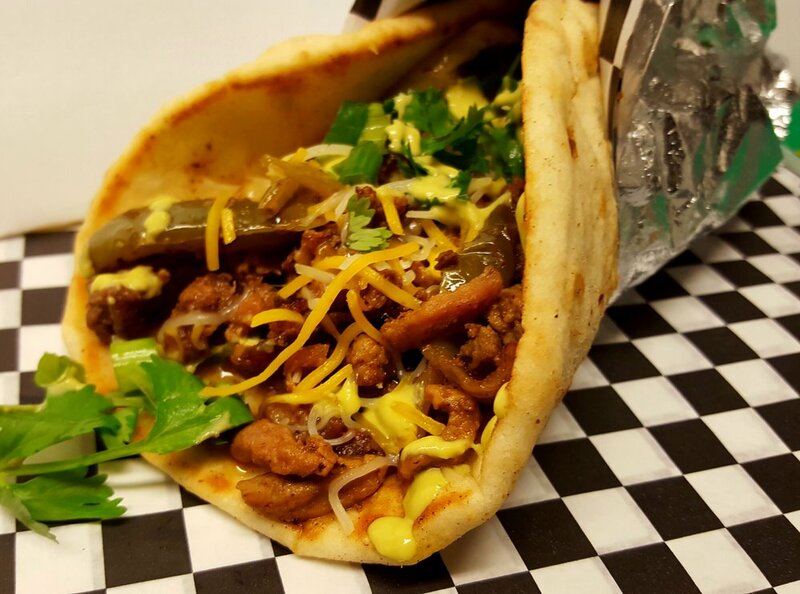 KOREAN PITA: A soft pita bread stuffed with Our Famous Korean BBQ Beef, cheddar and monterey cheese, green onions, cilantro, Korean spicy sauce and kimchi. KOREAN SPICY TENDERS: Crispy chicken tenders glazed with Korean bulgogi BBQ sauce, cheddar and monterey cheese, spicy Korean sauce, green onions, cilantro, and kimchi with a side of seasoned battered fries. MEXICAN FRIES A bead of seasoned battered fries with melted homemade queso topped with Mexican beef and pork fajitas steak, grilled bell peppers and onions, cheddar and monterey cheese, green onions, cilantro and our mouth watering Mexican hot green salsa. MEXICAN BURGER: A 1/3 lbs homemade beef patty topped with Mexican beef and pork fajitas steak, grilled bell peppers and onions, cheddar and monterey cheese, green onions, cilantro and our mouth watering Mexican hot green salsa. MEXICAN PITA: A soft pitta bread stuffed with MEXICAN FRIES A bead of seasoned battered fries with melted homemade queso topped with Mexican beef and pork fajitas steak, grilled bell peppers and onions, cheddar and monterey cheese, green onions, cilantro and our mouth watering Mexican hot green salsa. GREEK BURGER: A 1/3 lbs homemade beef pound patty, topped with Greek gyro meat (lamb and beef), fresh onions, tomatoes, tzatziki sauce, topped with feta cheese. 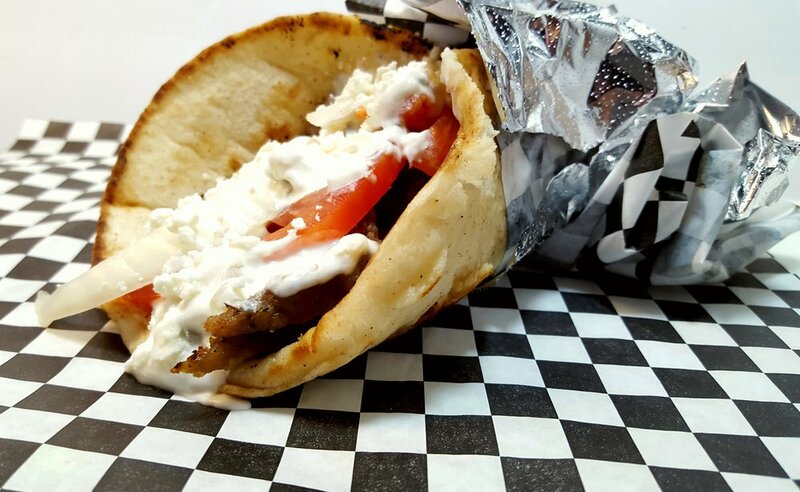 GREEK PITA (GYRO): A soft pita bread stuffed with Greek gyro meat (lamb and beef), fresh onions, tomatoes, tzatziki sauce, topped with feta cheese. GREEK SALAD: A bed of crisp lettuce, tomatoes, onions topped with gyro meat ( lamb and beef ) and feta cheese.